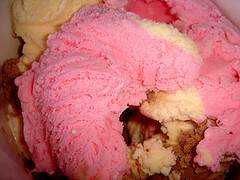 Try a yummy ice-cream-recipe that is homemade and rhubarb- flavored. A quick and basic homemade vanilla ice cream can enhance so many cakes, pies and crisp desserts. The different flavor combos are endless. If you have some simple ingredients like cream, vanilla and milk, you can easily make ice-cream yourself. You can flavor your ice-cream with any taste you like. How about trying it with your rhubarb? Beat in a large chilled bowl with an electric mixer 1 pint of heavy cream. Beat until you see stiff peaks forming. Gently fold the milk mixture into this whipped cream. Place into a shallow dish and freeze for at least 5 hours. Give it a good stir after a few hours, and then return to the freezer in an airtight container. This mixture will keep up to 10 days. Bring to boiling point, and then simmer on low heat for 15 minutes until the fruit is very soft. Stir occasionally. 2 1/2 tblsp. lemon juice. Stir until marshmallows have melted. Pour this mixture into a large bowl. Cover and refrigerate overnight. In a large bowl (chilled) beat 2 cups of whipping cream with an electric mixer until peaks form. 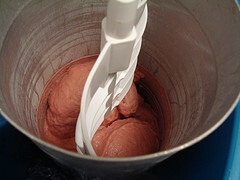 Gently fold this cream mixture into the chilled rhubarb mixture. Return to the freezer covered and in a proper container for approximately 6 hours. Add some variation to your ice-milk recipe like chocolate shavings or a crumble mixture just before the ice-cream is frozen for the final time. Bring to a boil and let simmer on low heat until rhubarb is tender and sugar is dissolved. Let cool. Stir in 1 1/2 tsp. lemon juice. In a separate chilled bowl, beat 1 cup of heavy cream until stiff peaks form. Gently fold in the rhubarb mix and place in a shallow pan. Freeze uncovered for at least one hour. Give a few good stirs during this time, and then cover and freeze overnight. If you prefer a machine for your recipes, see what is available in real-time at ebay.